The BBC spilled the beans on its impending digital overhaul, yesterday, detailing what it expects from iPlayer, amongst other things. Speaking to our sister magazine What Satellite and Digital TV , Ashley Highfield, director of Future Media and Technology at the BBC, also explained the re-design of the BBC.co.uk website and the mammoth task of archiving its entire catalogue. "Web 2.0 is an overused term, so we are going to be talking about Web 3.0," says Highfield. The BBC has already partnered with photo sharing site Flickr , as well as virtual community Second Life , where BBC Radio 1 hosted an online concert last year. According to Highfield, the Beeb plans to move more in this direction, creating websites tailored to individuals. Initially available only for Windows users, iPlayer will enable people to download their favourite BBC TV shows up to seven days after their initial broadcast. The shows will only be allowed to kept for a maximum of 30 days, some for seven days. The BBC is keen to make iPlayer available to as many as possible and is in talks with SlingMedia and Joost to extend the iPlayer's universal appeal. It also aims to support Sony's location-free TV. 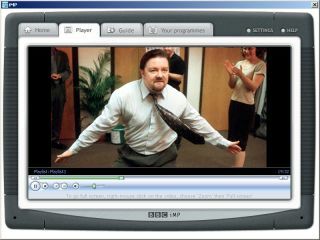 To restrict the piracy of the downloaded programmes, the BBC is using a digital rights management (DRM) scheme developed by Microsoft. According to Highfield, the Microsoft DRM is ideal as it enables the shows to be kept for only a set period of time. However the BBC has confirmed that it won't be working with Apple on iTunes support. "I would like it to be part of iTunes, but the DRM does not support the way the iPlayer works, such as making a programme available for seven days and then deleting it," explains Highfield. The Corporation is hoping to launch iPlayer in early May, after in-house testing and a trial period limited to 20,000 people. It will initially be available for PCs, with a Mac version arriving later. The BBC is even considering a set-top box version of the iPlayer for the home. But Highfield was quick to say that he didn't want Freeview to be weakened by the new online TV services. Other iPlayer services include a live feed of every BBC TV and radio channel and there will be no limit to the length of time users can keep a music download. The service will use peer-to-peer networking and as such will be able to deliver high definition video. The BBC has over 1.2 million hours of video in its archives. While the corporation would like to digitise it all and make it available online, the logistics make it an expensive and timely project. For now, it will archive 1,000 hours in a trial of such a project for the future. Highfield stopped short of saying such a move would be for the iPlayer's benefit, but one reason for undertaking the archive is to see how the public responds to the catalogue once it's available. Vital to both the iPlayer and the archive trial is a solid metadata system. "It will allow you to find actors and dates and anything else that would appear on all platforms," says Highfield. "If we cannot do that then all the iPlayers and archive will not happen. It's not a direct customer facing service but it is vital." For more details on all the announcements, check out the What Satellite and Digital TV blog.